The Panthers found themselves up against an empowered Titans outfit at Pepper Stadium on Sunday afternoon. Galvanised by their shock wins over the Sea Eagles and the Broncos, Gold Coast were clearly determined to turn their efforts over the past fortnight into a winning streak. Meanwhile, Penrith were just as determined to continue their stellar performances against the Cowboys and then the Eels, resulting in one of the most evenly matched contests of Round 6, at least over the first forty. The Titans were actually the first to make an error, with a mistake from Konrad Hurrell in the play-the-ball gifting the Panthers their first real attacking opportunity of the afternoon. For a moment, Penrith looked destined to score, as Tyrone Peachey beautifully regathered a loose ball during the windiest conditions of the season so far, James Maloney secured a repeat set, and Dylan Edwards actually crashed over in the right corner, by way of a tackle from Dale Copley and Kane Elgey. While the Panthers supporters in the crowd might have responded with a cheer, the putdown was ruled no try, and sent upstairs to see whether Edwards had managed to bust through the tackle or in fact committed a double movement. While the footage was a bit ambiguous, it did seem that Elgey and Copley had hands on Edwards when he got the footy to ground, no matter how elegantly he’d managed to clamber beneath and then around the tackle to try to aim for four points just after. That rapid shift in momentum was just what Gold Coast needed to build their own attack, and a couple of sets later some rapid movement up the left side of the field, combined with a catch-and-pass from Michael Gordon, saw Copley crash over in the corner through three Penrith defenders. While the putdown was clinical, the sideline conversion from Gordon was probably the highlight, as the ex-Rooster managed to boot the ball through the post despite the most challenging wind conditions of 2018. The game settled into more of an evenly matched groove over the next twenty minutes, as the Titans managed to keep Penrith tryless longer than any other team they have played this year. Both sides had moments of inspiration, and both sides had thwarted moments of inspiration, from a deft Ash Taylor grubber that Reagan Campbell-Gillard managed to clean up as efficiently as if he’d been the intended recipient, to a brutal hit from Viliame Kikau on Taylor that forced Nathan Peats to take the fifth tackle kick, only to lob it, inelegantly, right over to the side of the field. The drama continued down the other end of the park, where Kikau sent out a beautiful offload right on the line that Anthony Don managed to intercept, only to be called offside and come dangerously close to a professional foul in the process. Shortly after, Josh Mansour offloaded to Peachey right on the line, setting up a sequence of play that saw Maloney’s grubber come off the chest of a Titans defender, granting the Panthers the scrum feed and a fresh set of six that ended with a harbour bridge pass from Dylan Edwards back to Mansour that went too far. With so much thwarted strategy, it became clearer and clearer that, if the Panthers were to score, it had to be off the back of old-school competence and professionalism. That’s just what happened fifteen minutes out from the end, thanks to a beautiful sequence of passes from Peachey, Maloney and Edwards that saw all three players come up deep into the Titans line, before Edwards flicked the ball over to Corey Harawira-Naera to bust through a tackle from Copley to put down points. Once again, however, the conversion was the main focus, with the Penrith supporters holding their breath to see whether Maloney would pull off his thirtieth straight kick, bringing him within five of Hasem El Masri’s record of thirty-five with the boot. This time, however, the spiraling wind defied him, giving the try an ever so slightly deflated quality, especially with Peats taken off with a rib injury shortly after. It was already something of an upset that the Titans had managed to keep the Panthers out for so long – especially at a home fixture – but it would have been really serious for Penrith if they’d managed to go into sheds behind on the scoreboard. In fact, in the history of Titans-Panthers clashes, the winning team at half time has always been the winner at full time as well, putting a bit of additional pressure on the mountain men to bring home something special before their break. They did too and, once again, it came off professionalism and competence, rather than any fancy play. A neat pass from Peachey, and a deft offload from Isaah Yeo was all it took for James Tamou to find himself in a promising position ten metres out from the Gold Coast line, where the big prop pivoted off the left foot and then simply slammed through an exhausted Titans defence. It may have been the ex-Cowboy’s best moment this season, and a testament to the difference that being placed upon the interchange bench has made to the focus and strength of his game. This time, Maloney added the extras, and yet the Panthers’ lead felt anything but secure when they returned from the sheds, especially once Mansour was taken off after copping Anthony Don’s knee right in the face during a contest for a high chip in the corner. Yet, one of the leadership gestures that has made him so indispensable this year – and possibly the best buy of the 2018 season – Maloney followed up with a line break on the next set, skipping out of an ankle tap from Kevin Proctor and busting past Ash Taylor before getting the footy across to Edwards, who was burning up the field on his inside, and read the play perfectly to put down four more points. Things got worse for the Titans shortly after, as their penalty count reached 10-4 and Proctor was given a formal warning on behalf of his team. As fate would have it, Bryce Cartwright was the next to commit an error, on the next tackle, and was sent to the bin for ten minutes on the spot. If seeing a Panther-turned-Titan get binned wasn’t symbolic enough, then Mitch Rein was the next to receive an error, begging the question of whether both the ex-Panthers might receive ten for their troubles. 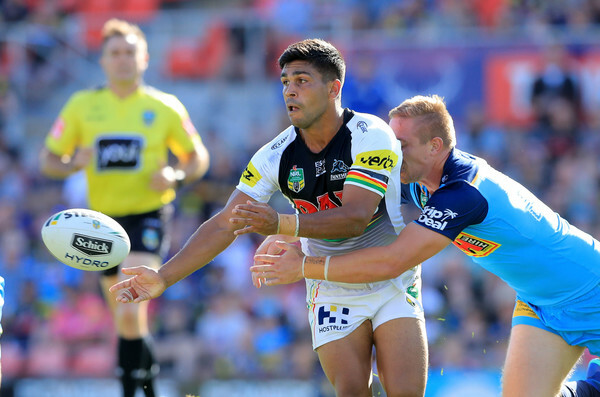 With Rein remaining on the field, however, the Panthers opted to take the two, and as Maloney added the points as reliably as ever to bring Penrith to triple the Titans at 18-6, Kaide Ellis ran out onto the park for his debut NRL match. Finally, this was starting to settle into the game that might have been expected for Panthers supporters, and sure enough Peachey went over on the next set, thanks to some deft interplay between Wallace, Maloney and Edwards through the Gold Coast ruck. The Panthers looked certain to cross over on the restart, too, putting in possibly their best six tackles of the night, as seemingly every player managed to get a hold on the football, culminating with a deft grubber from Peachey, who’s wearing the five-eighth jersey better than perhaps even he expected. The bounce was a dangerous one for Don, who was unable to get it to ground, but Gordon slammed up from behind to prove why he’s so reliable in these situations, getting a hand to the Steeden just before Peachey to save Gold Coast from leaking another four points. In fact, you could probably have made an argument that Gordon had touched the footy, but only Peachey had managed to get the ball to ground. Still, the Titans had started to recover some of the defensive resolve of the first part of the game, and Don consolidated it by making up for his misread of Peachey’s grubber at the end of the next set, smashing Kikau into touch on the back of a huge harbour bridge pass. From there, a rare penalty from Penrith got the Titans back down the other end, where some deft second phase play for Jarrod Wallace and a deftly weighted, oblique grubber from Elgey saw Don turn from trysaver to tryscorer in the corner. The four points were all the more rousing for Gold Coast fans in that Cartwright was just on the cusp of returning from the sin bin, but their momentum was short-lived, as Harawira-Naera put down a double a couple of minutes later. All in all, this was the most spectacular try of the game – a moment of sheer inspiration that made for a nice counterpoint to the seamless professionalism the Panthers had shown so far. It actually started with one of the messier sequences of the game for Penrith, as a series of catch-and-passes saw the Steeden move across to the right side of the field, albeit with a frantic, anxious rhythm that never made the possession feel secure or stable either. Sure enough, when it reached the big second-rower, it bounced a metre to his left, forcing him to clean it up so awkwardly that he actually popped it up in the air, gifting the Titans their best opportunity for a changeover all afternoon. Yet somehow Harawira-Naera managed to regather the Steeden, twirling around in a piece of play that looked chaotic and organised at the same time, and taking the Titans so utterly by surprise that there was barely a defensive line for him to run through. Once again, Maloney added the extras, and with the scoreline now advanced to 30-12 it didn’t look likely that the Titans would spoil Penrith’s party. Eleven minutes out from the end, however, the Panthers got a bit of a scare when Ellis was sent to the bin on his debut. Shortly after, what appeared to be a brilliant bit of work under the high ball from Harawira-Naera turned out to be a call of knock-on against the Panthers, gifting Gold Coast the scrum feed and a fresh set of six. Still, it was only a couple of minutes later that Maloney slotted through a field goal, a bit earlier than normally occurs, and with a bigger score differential than normally requires it, but in exactly the kind of foresight and vision that makes Maloney so valuable, since he’d clearly calculated there was just enough time for a freak burst to give Gold Coast a chance to come back if he didn’t manage to secure an extra point. As it turned out, however, these weren’t even the last points that Maloney facilitated for the Panthers, as he sped up the line on the next set and established the field position for Sione Katoa to sent a harbour bridge pass across to Christian Crichton, who crossed over for the final try of the night. 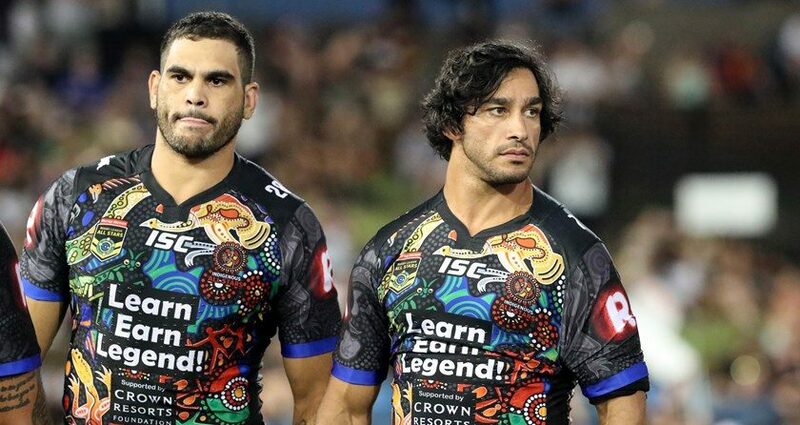 It was a stunning way for the Panthers to end, partly because it reaffirmed the power of the Penrith young guns – it was Crichton’s first NRL try – in the wake of Ellis being sent to the bin on debut. At the same time, Crichton’s four points felt a reaffirmation of the wing in the absence of both Mansour and DWZ, in part because this was no ordinary putdown, with the young flyer holding the footy firmly in the right hand and managing to ground it a millimetre from the sideline as the rest of his body was flung into touch. In the end, there was no way for the Titans to really respond, and they’ll be anxious to resume their winning streak when they take on a deflated Cowboys outfit in Round 7, just as Penrith will look to continue flexing their muscles against Cronulla, in what should be one of the more visceral games of this next round of football.